Penny Gold, a British crime film first released in 1973, has a number of things going for it, in particular a very good cast. It's led by James Booth, best known for his role in Zulu, but really a compelling and rather sardonic actor whom I enjoy watching. And then there is Francesca Annis, who has long been one of my favourite actors. A good supporting cast includes Nicky Henson, Joss Ackland (so good in White Mischief) and - in a minor part, before she became well-known - Penelope Keith, playing a model. Una Stubbs, Sue Lloyd, and John Savident also appear. The film opens with the murder of a young woman,and before long the cops, in the person of Booth and Henson are on the scene. One striking feature of their handling of the investigation is the occasionally aggressive approach of Booth in particular - this was, of course, the era of The Sweeney. It must have seemed very modern at the time, but is rather disturbing now. The storyline is quite complicated. It involves identical twins (yes, that old stand-by! ), a rare postage stamp, and more than one murder. Although they sometimes take a predictable course, I find stories about twins rather interesting. I've never written one myself, but maybe one of these days. Here the presence of twins in the story is - foreseeably - significant. A book of reviews that were written more than 80 years ago is never going to disturb Paula Hawkins and all the celebrity chefs on the bestseller lists, but this is a project that has been dear to my heart for years, and it's so good to see it come to fruition. And there was a "feelgood" atmosphere at the launch, which was gratifying. Other writers sometimes ask me about whether it is worthwhile to hold a book launch. I often regale them with an anecdote from my early days as a published novelist. 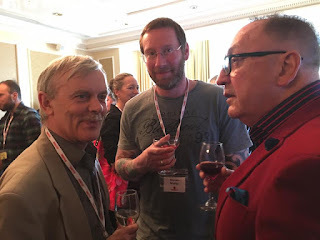 At that time, I was published by Transworld in paperback, and one day I travelled to London to have lunch with my editor to celebrate the appearance of my second book, Suspicious Minds. But my editor was unwell, and in her place was her boss, a very pleasant guy called Tony Mott. In my enthusiastic way, I asked him what advice he would give to writers hoping to improve their sales. He simply said, "Just remember that book launches don't sell books. They may be fun, but in the overall scheme of things, they don't make much difference." Years ago, I came across a brief mention in a reference book of Peter Drax as one of those writers who followed in the footsteps of Francis Iles, Bruce Hamilton, and C.E. Vulliamy as an author of realistic, ironic crime novels. Intrigued, I strove to find Drax's books, but they were hard to find. Eventually I was pleased to come across one, but they have remained elusive. Until now, that is. 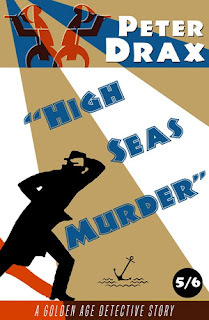 Dean Street Press have just reissued the six books that Drax published during his short life, and Rupert Heath of DSP recommended me to have a look at High Seas Murder, which I'd not encountered before. Rupert was right - it's a really good book. It was first published in 1939, and was the last novel Drax (whose real name was Eric Elrington Addis - I can see why he opted for a pen-name) produced in his lifetime. His crime writing career began in 1936, so he flourished only briefly. A senior naval officer, he was killed in a German air raid on Alexandria in 1941. After his death, a seventh book was completed by his novelist wife Hazel. Drax spent much of his adult life as a sailor, though he retired from the Royal Navy in 1929, and practised as a barrister until the war broke out. His knowledge of the sea informs this book, and the authentic feel of the story adds to its quality. But what I find very interesting is the fact that the story focuses almost exclusively on working class people in the fishing port of Gilsboro. The lawyers and the cops play only a minor role. Although (rather oddly) he is not the first character to whom we are introduced, the central protagonist is Carl Swanson, captain of a local fishing ship. His personality is key to the story - and it's a sign of Drax's skill that the final paragraph contains a clever twist that casts fresh light on Carl's psychological profile. There's a doom-laden feel to the story that today would undoubtedly be described as "noir". The writing is crisp and gripping, and Gilsboro is well-evoked: Curtis Evans' informative introduction doesn't suggest any real life model for the town, and though I have two or three candidates in mind, it may be an amalgam of several towns Drax knew. This is an enjoyable example of the ironic Thirties crime novel, different from Iles', Hull's, and Vulliamy's work yet certainly worthy of being associated with it. Dead Man's Evidence is a short film from 1962 starring Conrad Phillips, who was a very familiar screen presence in those days. The screenplay was written by Arthur La Bern, an interesting character whose most famous novel, Goodbye Piccadilly, Farewell Leicester Square, was filmed by Hitchcock as Frenzy. La Bern was a pretty good storyteller who was also a journalist specialising in true crime. And this is a story which, I suspect, was sparked by a real life mystery, even though I've not managed to find any discussion of the film which supports my theory. But in 1956, the mysterious disappearance of a frogman called Commander "Buster" Crabb made headline news. The puzzle has never been solved, though according to some theories Crabb was a spy who became a double agent. My guess is that the case inspired La Bern, even though his story moves in a fresh direction after the body of a diver with connections to the intelligence services is washed up on an Irish beach. Conrad Phillips plays David Baxter, an intelligence officer who is asked to look into the death of the diver. Could the body belong to a friend of Baxter's, who was suspected of being a double agent? The only clue is a ring that appeared on the dead man's finger, but which quickly vanished. Can someone be trying to conceal the identity of the deceased, and if so, why? Baxter pretends to be an insurance investigator, but a local journalist, a woman photographer and her mysterious boyfriend all become curious about his activities. The story zips along rather nicely, and there's a decent plot twist. The Irish setting is also well done. Phillips was a charismatic actor, even though he never became a really major star. He befriends a charming and seemingly naive young woman, a limited role but well played by Jane Griffiths; I'd never heard of her, but it seems that she died all too young. Overall, this unpretentious film is definitely worth watching. .
One of the features of the script is its economy. In the first scene, we see a girl being picked up on a lonely road. Soon a body is found by a group of children. We never learn more about the victim,and indeed we learn next to nothing about the murderer - not even what he looks like. The real question is: where will he strike next? Two sisters play central parts in the story. They come from a "nice" middle class family, and they chafe against the restrictions imposed by their kindly but relatively old parents. Christina Gregg plays the dreamy romantic Samantha, who runs into danger when she answers a phone ringing in a telephone kiosk. Her younger sister, played by Janina Faye, also gets enmeshed in Samantha's web of deceit with potentially disastrous results. Christina Gregg was 22 when the film was made, though she played a teenager. She does very well in the role, but appears to have married in the year the film was made,and given up acting; quite a loss. The best known faces in the supporting cast belong to Conrad Phillips, for once not playing a villain, and Dandy Nicholls, later to find fame as Alf Garnett's wife. This taut little film gives as clear a picture of conventional British society just before the Beatles era than you'll find in many a history book. I am a fan of psychological suspense, and in recent years I've read plenty of examples of the currently fashionable "domestic suspense" novel. Gone Girl, so well-written, is outstanding among them, but having just read Clare Mackintosh's best-selling debut I Let You Go, I'm inclined to think that, in terms of storytelling power, it's at least as good. Books of this kind tend to have certain common features, including one or more jaw-dropping plot twists. The snag is that sometimes the twists aren't really credible. No such problem with I Let You Go, where the first major plot twist, after a measured but interesting build-up of suspense, comes half-way through the book. When this particular structural device works well, as it did in Gone Girl, and many years ago in Ira Levin's brilliant A Kiss Before Dying, it can be highly effective. So it is here. The story begins with a hit-and-run car accident, which kills a five year old boy called Jacob. The police investigation fails to yield quick results, and we follow a developing relationship between two of the cops, as well as the enigmatic behaviour of grieving mother Jenna, who describes the way in which she begins a new life in south Wales. Then comes the first major twist in the story, and we hear for the first time from another voice. I don't want to say too much more, because to do so might spoil some of the pleasure afforded by this novel. It's a clever story, and I admire clever writing, but there's something else to be said (cryptically, to avoid spoilers!) This novel, written by a former police officer, gives us a shocking insight into a particular aspect of human behaviour that I found utterly compelling. It's all the more powerful because it seems highly authentic. Was I impressed? You bet. 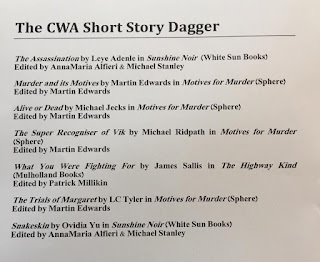 In case you're wondering, as Chair of the CWA, I keep a distance from the Daggers process, which is in the hands of a large number of capable and independent judges and Dagger Liaison Officer Mike Stotter. The independence of the Daggers judging process is part of the reason why the awards are held in such high esteem around the world. One publisher expressed dismay to me that a particular novel by a talented author hadn't made one of the longlists. But whilst I can always empathise with disappointment, publishers simply can't influence the judges, and that's the way it should be. We may not always share the judges' taste, but such is life. The convention kicked off for me, as usual, with the Authors Remembered session. I moderated a panel comprising Sarah Ward, John Lawton, Andrew Wilson and Jane Corry, and they did a great job of interesting the audience in a range of writers from Patricia Highsmith to Elizabeth Daly. There was time for a quick bite to eat before the traditional pub quiz, run by the admirable Peter Guttridge (photo above). My team managed to win, and we had a very convivial time of it. 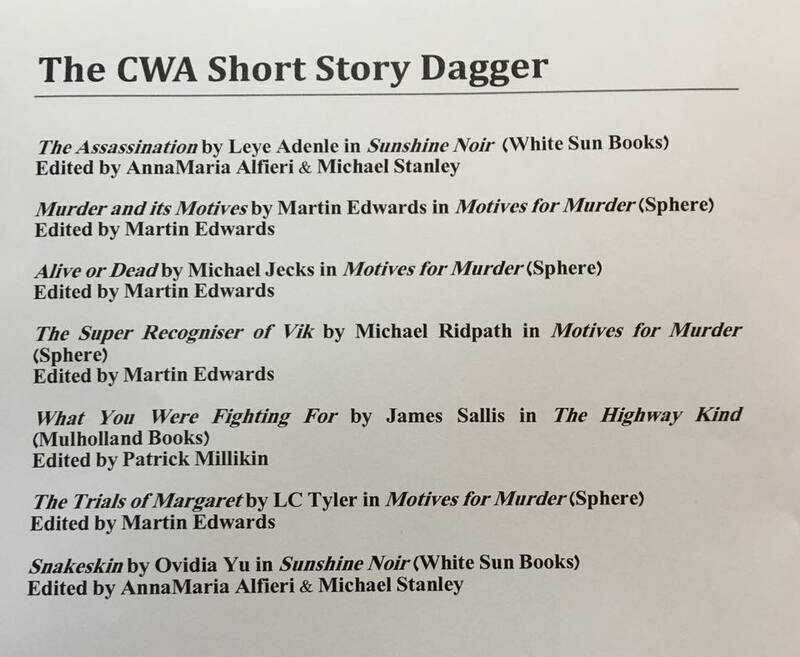 The Dagger announcements took place on Friday, and was followed by dinner with Thalia Procter of Little, Brown, publisher of Motives for Murder. My fellow guests included Peter Lovesey and the incomparable Ali Karim, whose company I always enjoy. Thanks also to Ali for his photography and video work. Saturday was a busy day. I interviewed Peter Lovesey, one of the guests of honour, and then took part in a panel moderated (extremely well) by Kevin Wignall. Then came an enjoyable drinks reception and the banquet. Ali videoed the interview with Peter and the film will shortly be available on the shotsmag website. On Sunday, I moderated another panel, this time on the short story. 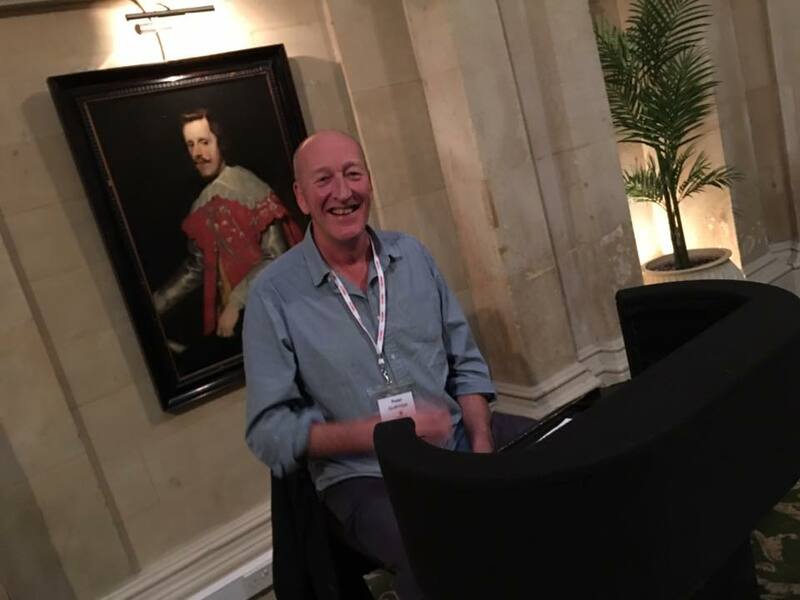 Given that my panellists were Len Tyler, Janet Laurence, Peter Lovesey and Ann Cleeves, it was a great pleasure and a great way to end a fantastic few days. Allied, first screened last year, is one of the best new films I've watched in recent months. It's a wartime thriller which stars Brad Pitt and Marion Cottillard as a couple who are pitched together in the fight against Hitler. They meet in Morocco,where Pitt, playing a Canadian spy,called Max and Cotillard, playing a French resistance fighter called Marianne, pose as a married couple who risk their lives conspiring together in an assassination plot. The killing of a senior Nazi goes according to plan, and by this time the pair have fallen for each other, turning their loving charade into reality. They go to England, marry, and Marianne gives birth to a child. Meanwhile Max's work in intelligence goes on. One day, however, he receives terrible news. Marianne is suspected of being a German spy. Can this possibly be true? Can Max really trust the woman he loves? The moral dilemma is nicely presented, and the tension continues to mount. I thought the screenplay was very crisply written. When I investigated, it turned out that the writer, Steven Knight, was also a co-creator of Who Wants to Be a Millionaire? He's obviously keen on games of cat and mouse, and Allied is a very good thriller indeed. Both the stars give strong performances, and rhey are well supported by a cast that includes the versatile Anton Lesser. Robert Zemeckis, a gifted director, does a good job with the material and there's a soundtrack by Alan Silvestri. Suffice to say that I found the film gripping from start to finish. Not all the critics loved Allied, but I did. Labels: Alan Silvestri, Allied, Anton Lesser, Brad Pitt, Marianne Cotillard, Robert Zemeckis, Steven Knight, Who Wants to be a Millionaire? High Tide was a novel published by P.M. Hubbard in 1971. Almost a decade later, the story was adapted for the Armchair Thriller television series in four episodes, and I recently watched, the complete mystery on Talking Pictures. Benefiting from a strong cast, it's stood the test of time pretty well, even if by modern standards the background music seems very intrusive. Hubbard is a writer who has been recommended to me by several good judges, but I've not read much of his work. In my shallow youth, I was deterred partly because he has a very low-key style, and wasn't especially interested in complex plotting, and partly because his main interests, such as small boat sailing, didn't coincide with mine. But I've come to appreciate his qualities more, and I intend to read him more extensively. High Tide is an atmospheric thriller rather than a complex puzzle, but it does feature a neat variation on the "dying message clue". Curtis (Ian McShane, at his best in this role) has just been released from prison after serving a sentence for manslaughter. He was responsible for the death of a man called Maxwell, whose mysterious final words prompt a rather menacing chap (played by Terence Rigby) to pursue him. Curtis figures out the meaning of the message,and befriends a pretty but mysterious young woman as he tries to find out what Maxwell was up to. His quest - undertaken by boat, in characteristic Hubbard fashion - leads him to a house occupied by an ill-matched couple, played by John Bird and the glamorous Kika Markham, who seem to have the clue to the mystery. The sequence in which Rigby's character gets his come-uppance is rather memorable. I enjoyed seeing this, and it's helped to strengthen my interest in Hubbard.. I've been looking for a copy of H.C. Bailey's No Murder (1942) for a long time. My interest in this book dates back to the time when I read a letter in that great magazine CADS, in which John Jeffries claimed that it's the best detective novel ever written. The quest was given further impetus nine years ago, when Barry Pike, a very good judge, discussed the novel in CADS, and concluded that, if not superior to the greatest Golden Age books, this outing for Reggie Fortune was right up there alongside And Then There Were None, etc. Barry's short but incisive essay pointed out that the book "is densely packed, with many strands to the narrative, including three violent deaths and three attempts to murder which Bailey handles "with great panache, leading the reader steadily up the garden. He demonstrates continually...the ability to tell one story while appearing to tell another". I agree that's a very significant gift for any detective novelist, and I also agree with him that Agatha Christie was the supreme exponent of this technique. Barry adds: ""The particular cleverness of No Murder lies in its continuous misdirection, maintained with great skill to the end." The book's American title was The Apprehensive Dog, and as Barry rightly says, "the significance of the dog's activities emerges only in the last few lines of the text." The snag is that this is a rare book, much harder to find than all the other classics to which Barry compares it. So why is it that such a gem has been hidden from view for so long? Now that I've read No Murder, I think I can guess the answer. The fact that it appeared during the war probably didn't help, but really the density which Barry mentions is reflected in the prose style, and this means that it's nothing like as smooth and slick as the best of Christie. Characters tend not to see things, for instance, they "descry" them. What is more, although the story is intricate and unusual, I didn't find it exciting. This is despite the fact that Bailey was, at his best, a genuinely powerful writer. But his techniques work best in short stories. One of the problems here is that the finger of suspicion points at too few people, and this frustrated me. There's also something anti-climactic about the story, a problem reflected by the title. That said, I was intrigued by the book and I'm glad I've read it. It's certainly original, and I do prize originality. But do I regard it as a masterpiece? I'm afraid not. The play I went to see was a local am dram production - Thriller of the Year, performed by the Bridgewater Players. The venue was Thelwall Parish Hall, down the road from home, which I last visited a couple of years ago to give a talk about crime writing. The Players are a long-established group - this production is their 179th. I've often seen adverts for their productions, but never found the time to watch them. Having prepared for the evening with a nice meal in the cosy low-beamed village pub across the road, I thoroughly enjoyed myself. The play dates from the late 60s - a landline telephone plays a central part in the story, and there are plenty of other period touches. The storyline rather appealed to me, a few days after receiving the Poirot- it features a crime writer returning home after winning an award! A variety of incidents make it seem as though someone wants her dead, and is using her prize-winning thriller as a template for the crime. Glyn Jones wrote the play, and one notable feature is that the cast of five is all female. Jones was a South African born actor, playwright, novelist, director, and lyricist who achieved the unusual feat of writing one early episode of Doctor Who and appearing in another. Some bits of the dialogue are rather wooden, and would have been in the 60s, and there were one or two iffy plot elements, but overall I was entertained. And the cast, led by Anita Rushman as the author Gillian Howard, overcame any first night nerves to do a sound job. I must also say that a ticket costing six quid with a cup of coffee and biscuits included has to represent fantastic value for a good evening out. Overdue as it was, I was glad finally to make the acquaintance of the Bridgewater Players. The launch of the book marks the culmination of a long journey, so long that it's taken several years to get to this point. After becoming fascinated by Sayers' reviews in the Sunday Times in the mid-30s, I suggested to the Society that they deserved to be published. This was agreed, and in the end, I would up introducing the book (there is also a foreword by Simon Brett) and writing a lengthy commentary. Putting the whole enterprise together was quite a task, but thanks to Sarah McIntosh, who painstakingly transcribed the original reviews, Seona Ford, and a number of other people connected with the Society, it has finally come to fruition. 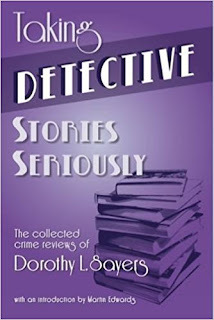 I'm excited about it, because I think the reviews are a wonderfully informative resource for mystery fiction fans. What's more, they read very well, despite the fact that Sayers put them together under great pressure of time. 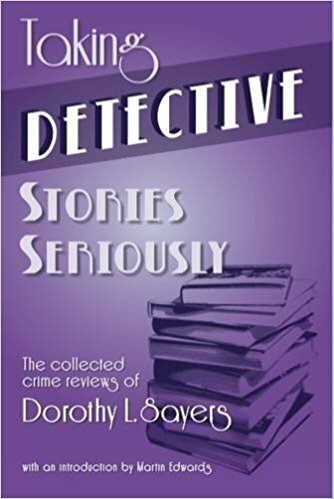 She was, arguably, at the peak of her powers when she wrote them, and even if you aren't a huge fan of Sayers, I think that if you like classic crime ficition, you'll find plenty here to fascinate you. Reaction to the book has already been very positive - here's a lengthy review by Kate Jackson which I was delighted to see. Even if you can't make it to the launch, you may well find the lure of the book hard to resist. I hope so. Since I read my first Maigret novel at a tender age, I've been interested in crime fiction in translation. Until recently, however, there was a real shortage of Golden Age crime translated into English. All that is, happily, beginning to change. And as I mentioned recently, I'm making my own contribution to this by putting together Foreign Bodies, an anthology to be published by the British Library later this year. Meanwhile I'm taking the opportunity to extend my knowledge of foreign crime fiction of the past. An example is The Mystery of the Three Orchids by Augusto De Angelis. It was published recently by Pushkin Vertigo, who were also responsible for introducing me to the books of Frederic Dard. The translation by Jill Foulston is smoothly readable. It's not a long novel, and none the worse for its relative brevity. The setting is Milan, where a man's body is found in a leading fashion house. An orchid has been left nearby. Soon, another murder is committed, the victim this time being female. Again, an orchid seems to have been left on the scene by the murderer. What is the significance of the flower, and who is responsible for the crimes? Inspector De Vicenzi, a likeable fellow, sets out to solve the puzzle.An American gangster appears in the story, a plot development that usually makes me wince, but overall it's a nicely done story, and at least the gangster plays a crucial part in the plot. There's a useful afterword which supplies a little background info about the author. De Angelis (1888-1944) led an interesting life, and enjoyed considerable success with his fiction. The Murdered Banker (classic title!) appeared in 1935, and this particular novel came out seven years later. Sadly, injuries sustained as a result of a beating by Fascists proved fatal two years after this book appeared. But thanks to Pushkin Vertigo, his work is enjoying a new lease of life, and a good thing too. After weeks of breathless globe-trotting, I'm back in sunny Cheshire for a while now, and I've a chance to reflect on some marvellous trips, most recently to Malice Domestic 29 in Bethesda, Maryland (a suburb of Washington DC). Malice is an exceptionally well-run and friendly convention which focuses on the traditional mystery. This was my fifth time at Malice, and after receiving one of their prized Agatha awards last year, I was extremely fortunate to be honoured again. This time I was presented with the Poirot award; which is given in recognition of a significant contribution to the traditional mystery genre. It isn't awarded every year, and the contribution in question may be quite distinct from writing books - the very first recipient was David Suchet, and last year the Poirot went to Barbara Peters and Rob Rosenwald, whose Poisoned Pen Bookstore and Press have made such an impact over the past twenty-odd years. It was a great honour, and I was delighted to share the evening of the awards banquet with some special guests, including Doug Greene (a past recipient of the Poirot), Steve Steinbock, and British writers Ann Cleeves and Frances Brody. Also on my table was Cathy Ace, originally from Wales but now Chair of the Crime Writers of Canada, who interviewed me about my career and did a fantastic job. 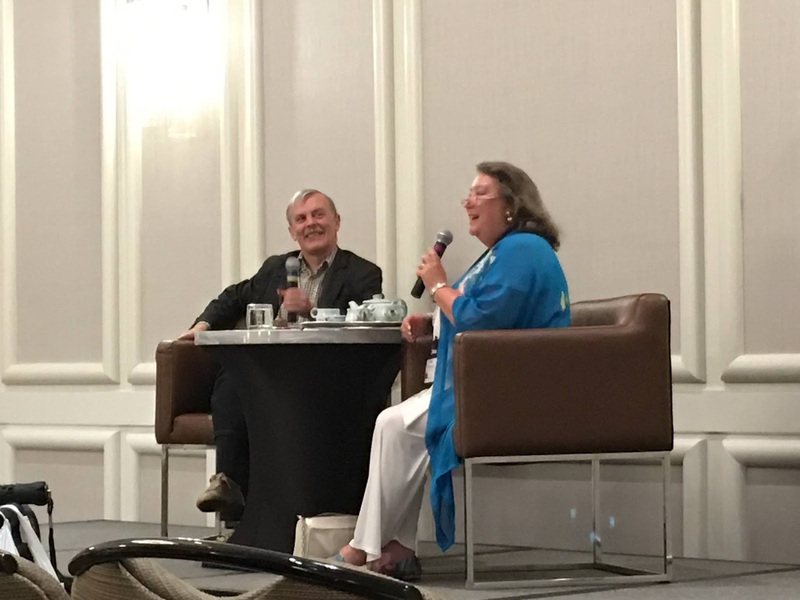 I also enjoyed being part of a panel including other honorees such as Charlaine Harris and Elaine Viets, and signing copies of the Malice anthology, Mystery Most Historical, which includes a story of mine. To my delight, Crippen & Landru produced a specially published edition for convention delegates of my short story "Acknowledgments". .
As ever with conventions, I tried to fit in some sightseeing, and I can certainly recommend a river cruise on the Potomac. One of these days I'll make it as far as Mount Vernon....The weather was gorgeous, so I spent as much time as I could outside, visiting various monuments as well as the botanical garden. Washington is a great city. As for the convention, it passed all too quickly, but I was delighted to spend quality time with old friends and new, including Janet Hutchings of Ellery Queen's Mystery Magazine, Gin Malliet, Michael Dirda, and Elaine and English Showalter. It was good, too, to meet John Norris, whose blog Pretty Sinister Books I've long enjoyed, for the very first time. 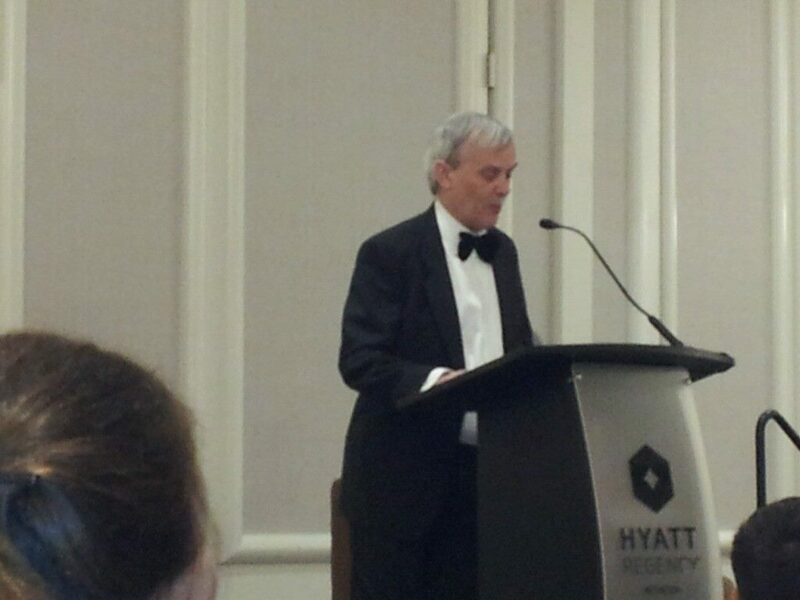 My thanks and congratulations go to the Malice Board, who always do such a fine job. I've already registered for next year, and if you like crime conventions, this is one I can strongly recommend. Danger By My Side, which first hit the screens in 1962, proved to be the last film directed by Charles Saunders, whose better-known brother, the theatrical producer Sir Peter, is known to mystery fans as "The Mousetrap Man". This movie is a straightforward but lively thriller which seems slightly dated despite the inclusion of a strip-tease in a night club that seems extremely tame by today's standards. A prisoner called Hewson, played by Brandon Brady, is released from jail. He was a member of a gang involved in a robbery, and is given work by the gang boss, Venning (Alan Tilvern) who has his finger in a number of pies. An undercover policeman who has penetrated Venning's operation is killed in a hit and run incident, and Lynne, the dead man's sister, played by Maureen Connell, determines to bring his murderer to justice. Lynne takes a job at a night club run by a manager in Venning's pay. The manager is played by Bill Nagy, whom I remember distantly as pal of the American soldier who married Elsie Tanner in Coronation Street's hey-day in the Sixties. He's one of the few recognisable actors in the cast, along with Anthony Oliver, who plays Inspector Willoughby. Maureen Connell gives a good performance, and it's a shame that her career was not long-lasting. Even less renowned is Kim Darvos, who plays a singer in the night club who meets a grisly end. This is another of those short and snappy thrillers which strove to capture criminal life in the years immediately before the arrival on the scene of the Beatles, who changed British popular culture in so many ways. It's not a sophisticated movie, but still a competent piece of light entertainment.